If the IRS decided to target you in a criminal case, the Service has a 90% probability of winning at trial. A look at Messi’s criminal case and the public backlash his club faced when they attempted to support him in his claim of innocence will help you understand why it’s nearly impossible to beat the IRS in court. For those of you not familiar with soccer outside of your kid’s AYSO team, Messi is one of the top forwards of our generation. He pays for Barcelona, earning €36 million a year, and is known to take over a game. Unlike in the NBA, this level of dominance is quite rare and not seen since Pele. If you could care less about international soccer, all you need to know for this article is that Messi is big time. Anyone identified by only one name must be important! Think of Lebron, Shaq, Tiger, Jordan, Bono, Prince, and Madonna (yes, I’m a child of the ‘80s), all greats. I’ve always dreamt my little blog would become so big I could go by Reeves without anyone thinking of Christopher / Superman. Messi and his father (who was his financial advisor) were recently charged with tax evasion in Spain. Both decided to go to trial and were promptly convicted by a Spanish court of 4 counts of tax fraud. They were sentenced to 21 months and ordered to pay €3.5 million in taxes and penalties. Under Spanish law, those with sentences of less than 24 months don’t go to jail… they were released with 2 years of probation. The 25 year old Messi has maintained his innocence throughout the process. He claims that he didn’t manage his money and had no idea what tax plans his advisors put in place. Basically, he was too busy playing soccer around the world and chasing supermodels to worry about taxes. Messi’s father says he and he alone was working with the tax planners and that his son had nothing to do with it. That his son had no idea what tax schemes the advisors had cooked up. In a rare showing of support, Messi’s football club, and the president of the league his club plays, in both say he’s innocent of the charges. Having been around the block a few times, I tend to believe Messi. My guess is that the Spanish authorities decided to make an example out of him because of his fame. To get others to fall in line by making an example of someone famous… taking a play out of the IRS offshore playbook. Our IRS does it all the time. The US offshore voluntary disclosure program is based on making an example of Americans with offshore accounts to scare the rest into compliance. Whether Messi is innocent or not, it’s the support of his club and league I’d like to talk about. More specifically, the backlash these statements of innocence elicited from the general public and what we in the US of A can learn from them. 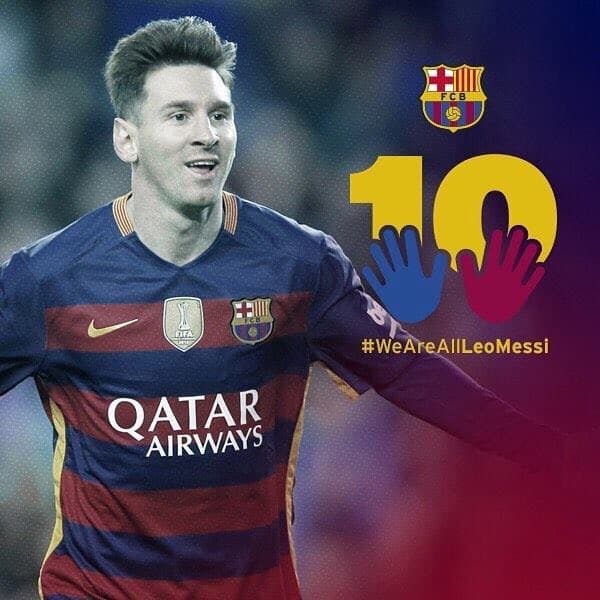 Barcelona thought it would be a good idea to put out the hashtag #WeAreAllLeoMessi to get good wishes and support back from their fans. Of course it failed in spectacular fashion. The general public reads that the government accused someone of cheating on their taxes and assumes it to be true. Messi was convicted in the court of public opinion long before he was sentenced. If this is the kind of support a beloved footballer gets, what hope do we average mortals have of beating a tax charge? In the United States, if you have a million dollars to spend on high priced lawyers, your probability of success is about 10%. If you don’t have money for fancy advocates, you’re done before the jury’s been selected. The reason the IRS wins all its cases are simple: a jury of your “peers” is not made of of hard working international entrepreneurs and business owners. It’s comprised of average people like the tweeters above who will convict you right after lunch (not before because they want the free meal). The members of the jury pay their taxes, so why didn’t you? And with that simple question, and the assumption that the government can do no wrong, you’re convicted. If Messi had been charged in the USA, he probably would have gotten 3 to 5 years in prison, considering the severity of the charges and that tax amount. So, the next time you’re thinking about messing with the IRS, just remember these tweets and whether you want these people sitting in judgement of you. We’re not all Messi, but we are business people who work offshore, operate in several countries, and often push the tax envelope. We all need to be careful when it comes to dealing with the all powerful IRS. I hope you’ve found this article helpful. For more information on US tax compliance and the Offshore Voluntary Disclosure program, please contact me at info@premieroffshore.com or call (619) 550-2743. We will be happy to work with you to get your US taxes in order.